The Animal Husbandry, Dairying and Fisheries Department of Tamil Nadu Government has stated that the ordinance exempting jallikattu from the Prevention of Cruelty to Animals Act has been brought in, considering ‘the vital role played by the event of ‘Jallikattu’ in preserving and promoting tradition and culture among people in large parts of Tamil Nadu, and also considering the vital role of jallikattu in ‘ensuring survival and continuance of native breeds of bulls’. The participants shall not be permitted to stand in front of the bulls as they enter the arena. They shall also not be permitted to block the exit way for the bulls. The participants shall be permitted only to embrace the bulls by their hump and run along with the bull for 15 m or for 30 sec or sustain three jumps of the bull. After the run of 15 m, when the bulls enter the Bull Run area, the participants are not to be allowed to touch the bulls. The participants shall not hold on to the tail, horns using their hands or restrict the movement of the bulls by holding on to the bulls’ legs. Participants violating these guidelines shall be liable to be debarred from participating further in the event. 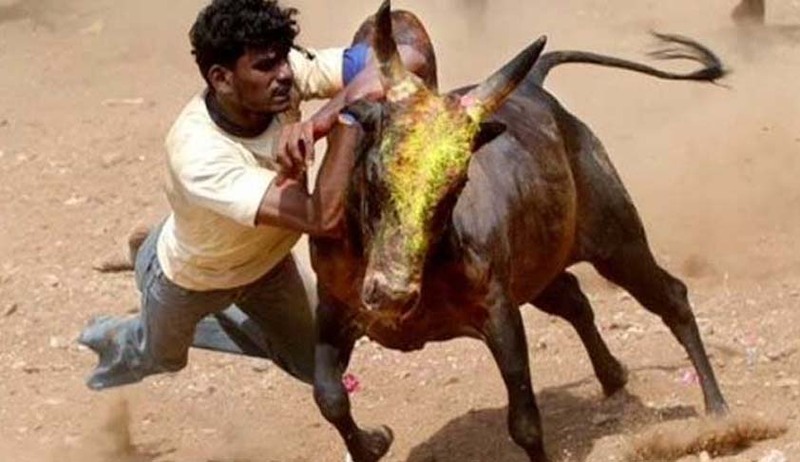 As per rules, the organisers should get prior permission from the Collector for the persons as well as their bulls for participating in the jallikattu event. The Collector shall, with the assistance of experts of Animal Husbandry Department, ensure that the bulls are free from any diseases and not intoxicated or administered with any substance with the object of making them more aggressive or ferocious.